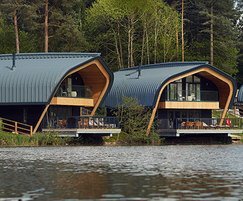 The winning project of the 2018 Structural Timber Awards ‘Best Retail & Leisure Project’ and ‘Best Use of Solid Wood’ categories were three Waterside Lodges at Center Parcs Elveden Forest. They have all been built using Metsä Wood’s Kerto® LVL (laminated veneer lumber) for fast, light and green construction. The lodges were designed to complement the woodland landscape to connect the guests with the surrounding natural environment. Wood was a natural choice of building material, which would blend in seamlessly with the natural forest setting. Metsä Wood’s Kerto® LVL was sufficiently lightweight to achieve the impressive structure, without needing a considerable amount of foundation works. It has a solid bonded structure, which offers incredible strength and dimensional stability, while its high strength-to-weight ratio allows for smaller spacing in mechanical connections.